Read all about it here or in the original press release from Columbia's Mailman School of Public Health. I've blogged about this before, and about how I must live in a city where I can be car-free if I want to be. Active Living Research appears to be an organization and grant-giving institution that studies the relationship between architecture/urban planning/design and healthy living. Active Living Leadership tries to act on that research by working with governments, programs, planners to encourage healthy living. The intersection of public policy, public health, urban design, and environmental science is all very interesting to me. I was not an active child--far from it. All I really ever wanted to do was read (and sometimes write). One could argue that that is still the case. Nonetheless, because we had only one car and because we never used it on Shabbat, I got out at least a little bit. I also used to walk or take public transportation to school until I was eight and switched schools. I think I had many of the benefits of urban and suburban living. In addition to living about a mile away from school, I also grew up with a large backyard and a playground down the street. Regarding the playground: When they replaced the old metal playground equipment with newer, plastic equipment in 1988, the fun level definitely went down. I couldn't find good photos of all of this stuff online, but do you remember the old metal-animals-on-springs? (In particular, I remember a horse that looked like this. It's from a NYPIRG website about toxic playground equipment.) Long metal slides? Metal climbing structures? Jungle gyms? That merry-go-round thing that, unfortunately, some poor kid's head got stuck under somewhere, rending them obsolete nation-wide? I also remember this metal thing that we used to play in as if it were a train, but I think it was really an old planter that didn't have any plants in it. I think that all of the metal playground equipment, prone to rust as it was, was removed right and left. I also remember the concrete playground equipment from childhood summers in California, the disappearance of which this person laments. What's the point of going to the playground if there is no chance you'll fall through the jungle gym and crack your head open? I mean, seriously! The new equipment is so safe! I remember when they replaced the hard dirt under the local swings with wood chips. Now, I think there is probably some kind of black plastic or rubber mat under them. Also, I think that the first kind of structure lends itself to more imaginative play. It could totally be an airplane, pirate ship, school bus, house, monkey cage, or almost anything else you could think of. Personally, we used to turn the local jungle gym into a convenience store and have my father purchase things from us. But maybe that's just me, being nostalgic for a time when I could have fun in this way without, well, looking like a weird grownup. 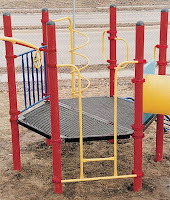 I stumbled into your blog while searching for images of playground equipment for an animation project I am working on. I completely agree with you.It seems that playground design now is meant to not only protect children, but to also shield them safely from their own imagination.